This entry was posted on Saturday, October 4th, 2008 at 1:23 am	and is filed under Newslinks. You can follow any responses to this entry through the RSS 2.0 feed. You can leave a response, or trackback from your own site. 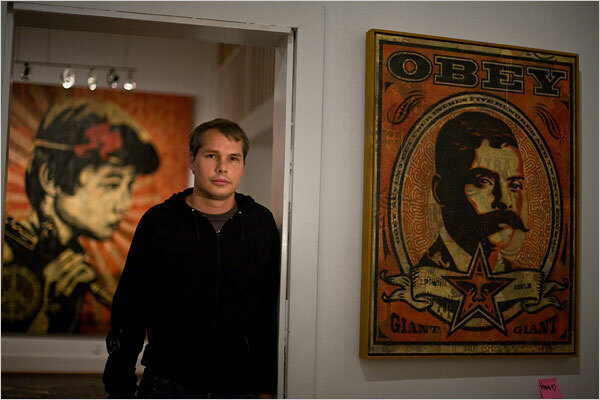 Radar did that same bombing with Shepard Fairey article less than a month ago! Fairey has violated international copyright laws more than once. The guy profits off of other artists. If it was not for the Obama fandom you would have only known about him by reading juxtapoz or some other underground rag. Funny that Obama gave donations from one criminal away to charity instead of accepting them as campaign funds but is more than willing to accept the funds raised by this criminal. How many times has he been arrested for bombing since the campaign? Why does Obama support an artist who supports actions that cost tax payers billions per year? Expose this clown instead of giving him props!